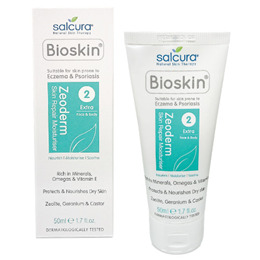 Salcura Bioskin Zeoderm Extra Face & Body Moisturiser has a proven track record and is one of Salcura`s most effective and practical solutions skin conditions. 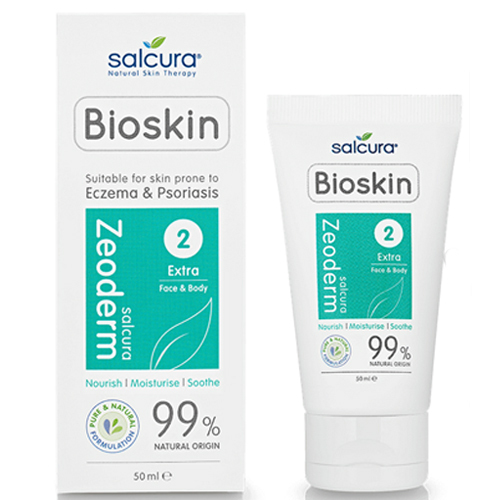 Salcura Bioskin Zeoderm Extra Face & Body Moisturiser is quickly absorbed, non sticky and penetrates the damaged skin deep down for maximum moisturisation. One of the main active ingredients in Zeoderm are natural minerals in a nano form. The patented ZeomaZ ingredient features Tribo-Mechanically Activated Zeolites. ZeomaZ has been classified as a Medical Product Class 1 for skin and wound care. ZeomaZ is formed from natural volcanic micro porous silicate minerals (Zeolites) and are non-allergenic and non-toxic. Zeoderm also contains silicate minerals which are essential both to the human body and human skin but are unfortunately not produced by the body and have to be obtained by other means. The presence of this vital mineral in Zeoderm is extremely beneficial for damaged, dry, inflamed and irritated skin cells and connective tissues. Zeoderm is best used in addition to Salcura DermaSpray when the surface skin is particularly cracked or damaged. Apply at least 3-4 times a day initially onto the affected areas. When skin has returned to relative normality, continue using the product to top the skin up with Zeoderm`s vital nutrients at least 2-3 times per week. This should keep the symptoms controlled. Suitable for applying to the face and around the eyes. A tingling sensation may be experienced at first but this should subside quickly. The product should ideally be used in conjunction with the Salcura DermaSpray Skin Nourishment Spray range - applying shortly AFTER these spray products. Suitable from 12 years plus. Below are reviews of Salcura Bioskin Zeoderm Extra Face & Body Moisturiser - 50ml by bodykind customers. If you have tried this product we'd love to hear what you think so please leave a review.